Fecon offers a wide range of stump grinding attachments in our Stump Hog line for skid steers and excavators and forestry prime mowers. Stump Hogs can be matched with most brands of high-horsepower, high-flow skid steers or loaders. Our high horsepower hydraulic stump hogs are designed for hydraulic forestry prime movers on tracks or wheels with 200-300HP. Fecon® offers three different models of excavator stump grinding attachments SH360-45, SH360-61, SH360-100. The reach, mobility, and precise control using the curling action of the excavator make it the ideal platform for stump grinding. With Fecon excavator stump grinders the operator always has a full view of the disk and stump. Fecon® offers three models of Stump Grinders: the SH270, SH280 and the SH400. These Stump Hogs can be matched with most brands of high horsepower, high-flow skid steers or loaders and forestry prime movers. Fecon provides engineering support to ensure you are getting the best model and hydraulic protection for your carrier. The SH270 is the ideal Stump Hog for high horsepower and high flow skid steers. At 1,675 lbs. and a 26″” wheel, this Stump Hog is ideal for Skid Steers. The SH400 is the heavy duty Stump Hog for loaders or forestry prime movers. This attachment will accept up to 85 gpm and can be mounted to virtually any prime mover in the 200-to-300 HP range. It has a working depth of 40″” and telescoping abilities of up to 24″”. 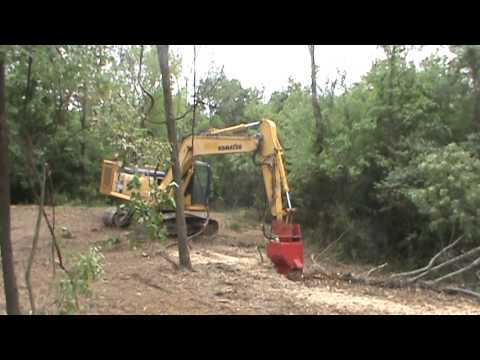 Fecon offers high-performance stump grinders for hydraulic tractors and forestry prime movers on tracks or wheels. Fecon can equip each stumper with pin on or quick attach mounts to interface with your machine of choice and will work efficiently with the standard hydraulics of most carriers. The SH400 is the heavy duty Stump Hog for loaders or forestry prime movers. This attachment will accept up to 85 gpm and can be mounted to virtually any prime mover in the 200-to-300 HP range. It has a working depth of 40″” and telescoping abilities of up to 24″.